Here is a quick list of things you need to prepare for before a fight. Do you have your health clearance? Do you have your Doctors certificate? be professional, know the rules - be safe, be all star! As more states legalize and sanction mixed martial arts events these Unified Rules of Mixed Martial Arts drawn up by the California State Athletic Commission in 2000 and adopted by the Nevada Athletic Commission in 2001 are becoming standard to safeguard fighters. “Tournament” or “State Championship” shall mean all events encompassing CAMO’s California State Championship for Amateur Mixed Martial Arts. The Tournament shall be a single elimination tournament, except as provided under §402 of the Tournament Rules. § 201. CAMO License Required. May be randomly tested, and agrees to take such tests, for the use of any drugs prohibited by the California State Athletic Commission for professional MMA fighters, and may be disqualified from the Tournament for failing such tests. § 202. California Residents Only. In order to participate in the State Championship, a Contestant must be a citizen of the United States and a California resident. Proof of residency must be shown to designated CAMO officials on or prior to the time of weigh-in for the first round of the State Championship. Either (a) a current California driver license, or (b) a US Passport or some form of government issued identification with picture and a utility bill in the contestant’s name showing a California address, shall be sufficient proof of residency. § 203. Invitation to Compete in the State Championship. The promoter's hosting the first round of the Tournament in each of the eight (8) regions selected by CAMO ("1st Round Promoters") shall choose the 2 Contestants (plus one alternate) in each weight class to compete in the first round of the Tournament for their region. Such fighters are subject to the approval of CAMO. 1st Round Promoters shall use best efforts to match up the best fighters in their region to compete in the Tournament. A Contestant need not be a resident of a region to compete in that region's bracket. Any fighter who made it to the final of the State Tournament in 2010 gets an automatic spot as a Contestant in the opening round of the Tournament in the region in which they reside ("Qualifying Fighter"), so long as they meet the requirements listed in Section 201 hereof. Such Qualifying Fighter must notify 1st Round Promoter in writing no later than June 17th, 2011, that they will be competing in the 2011 California State Championship Tournament, or they will lose their automatic spot. A twenty-five dollar (US $25.00) registration fee, per Contestant, will be paid by Contestant to CAMO upon registration (waived for 2011 Tournament). § 206. Fighters from Same Gym. Two Contestants from the same gym or school shall not be allowed to compete in the same weight class in the same region (for example, two fighters from the All Amateur MMA Gym, shall not be allowed to compete against each in the 155 lb weight class in the Los Angeles region. However, for example, for each weight class, 1 may compete in the Los Angeles region and 1 can compete in the San Diego region). Contestants shall be responsible to provide their own transportation to all Tournament events. Hotel rooms shall be provided for any Contestant competing in the State Championship final event whose principal residence is more than one hundred fifty miles from the venue for such State Championship final event. § 301. AMMA Rules Apply. 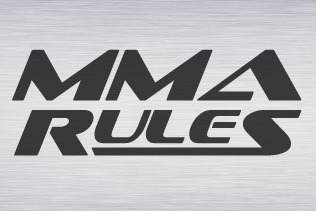 Unless otherwise specified below, the Tournament shall be governed by the AMMA Rules. Contestants shall be weighed pursuant to section 621 of the AMMA Rules, and all weights will be given a one-pound allowance for scale discrepancies. If Fighter fails to make weight, is no more than 2 pounds over the appropriate weight class, and CAMO and/or the attending physician deems it reasonably safe to lose additional weight, the Fighter will be given one hour to make weight. Failure to make weight will result in disqualification from the Tournament. The contests shall be for three rounds, each round not to exceed two minutes in duration. § 305. Determining a Draw. In the event that the scoring system used to judge the contest results in a draw, the points awarded by the table judge for the contest shall determine the winner. If no table judge exists, the judge(s) scoring the bout a draw shall determine a winner. If the bout is still a draw after the above, the referee shall determine the winner. If a Contestant registers for the Tournament and fails to participate in any round for any reason other than failing to obtain medical clearance for such bout pursuant to a pre-fight physical or pursuant to a writing from a medical doctor, such Contestant shall be suspended from the CAMO program for a minimum of one hundred twenty (120) days. §401. Alternates in First Round. Is not a US Citizen and California resident. By the alternate who lives closest to the venue for such event who was picked by any 1st Round Promoter. Any Contestant in the same weight class who lost during that round by split decision. Any Contestant in the same weight class who lost during that round by decision. If no Contestant meets the above criteria, than Contestant who was supposed to meet Non-Continuing Fighter in next round will receive a buy. If in Final round; qualifying fighters can be drawn from round of the Tournament held prior to the round in which Non-Continuing Fighter was injured. If no qualifying Contestant is found in the prior round, then the next round will be looked at and so on until a qualifying is found.